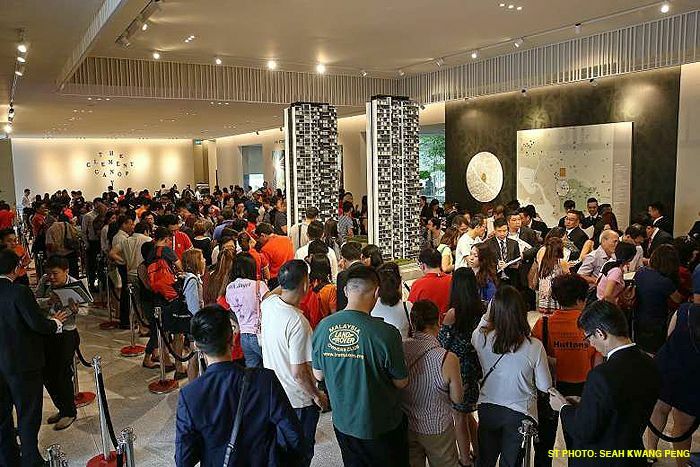 Over last weekend, the Clement Canopy – a new launch condo project at Clementi Avenue 1 has managed to sell a total of 195 units (out of 505), which equivalent to 38.6% of the entire development. According to developer UOL Group, approximately 250 units were released for sale during the 2 days, resulting in a take-up rate of 78%. It was added by the developer that there was strong interest shown across all various unit types at Clement Canopy, attributed to the project’s reasonable price point and the pent-up demand within the precinct. Given the healthy response shown, UOL group will be extending the early-bird discounts for one more weekend – which comprises a deduction of $6,000, $8,000 and $12,000 for 2-bedroom, 3-bedroom and 4-bedroom units respectively. Selling prices at the Clement Canopy for a 2-bedroom unit (635 to 657 sqft) ranges from $850,000 to $1.1 million, $1.28 million to $1.4 million for a 3-bedroom unit (990 to 1,163 sqft) and a 4-bedroom from $1.62 million to $1.82 million. Looking back at the Government Land Sales 1H2016, the land was acquired by developers UOL & SingLand for $302.1 million ($615 psf ppr), which sets up the breakeven price to be approximately $1,100 psf.